Briolette Beads & More is located in the heart of downtown Forest Park at 7322 West Madison St. We’ve recently remodeled our store. Stop on in and take a look! 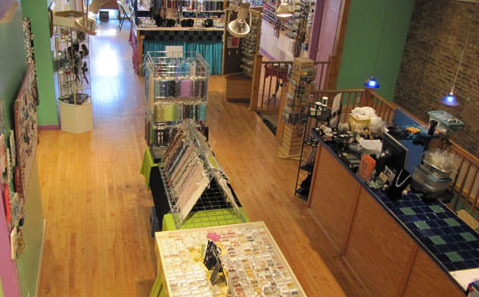 Briolette Beads, sister store to Caravan Beads of Chicago, carries a unique selection of craft supplies for the beader, altered artist, rubber stamper, or paper crafter. Above: The newly renovated store, from our office balcony. Above: Our czech glass wall. Above: Our newly painted party room.